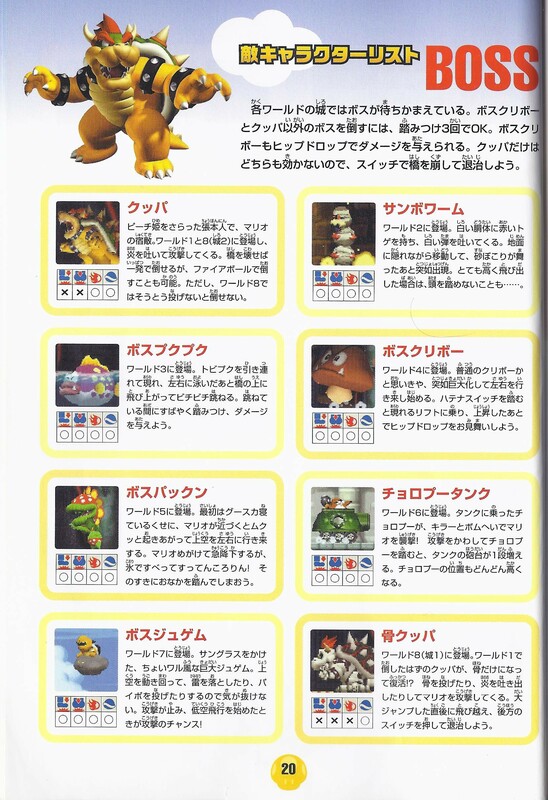 This article is about the boss that appeared in New Super Mario Bros.. For Pokey relatives which appear in Paper Mario, see Pokey Mummy. Mummipokey is the second boss in World 2 of New Super Mario Bros. It is a mummified Pokey with red spikes, along with a bear trap-like jaw from which it spits projectiles. During battle, Mummipokey attacks by popping out of the ground at different places throughout the battle. Mario or Luigi must jump on its head three times to defeat it to gain access to World 3. Mario or Luigi can also ground pound on its head to reduce the number of hits it takes, as Ground Pounds deal double damage. The height of how far Mummipokey protrudes varies, ranging from 2 to 5 segments, including the head. The time it stays surfaced is dependent on its size: the longer the segments are exposed, the longer Mummipokey stays surfaced. Sometimes, Wall Jumps are required to get enough height in the air to land on its head. Mummipokey can also spit a projectile ball at Mario. Another way to defeat Mummipokey is to shoot it with 15 fireballs or use a Mega Mushroom. Access to World 4 can be earned if Mummipokey is defeated while Mario or Luigi is in their mini form. 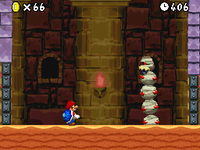 Since the Mini Mushroom causes Mario and Luigi to get both smaller and weaker, they must Ground Pound Mummipokey to apply any damage. ↑ Loe, Casey. New Super Mario Bros. Official Nintendo Player's Guide. Page 14. This page was last edited on December 6, 2018, at 15:48.